Need a creative solution for a jam-packed art gallery? Or is the venue where you are supposed to organise an art show not really suited for the event? Screenflex portable room dividers are not just appropriate for people who need to segment large spaces in smaller, more private areas. 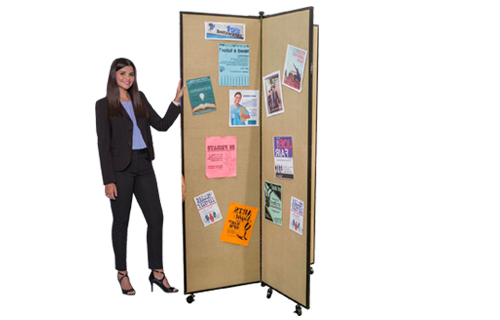 Our specially designed mobile partitions come with quality panels that allow you to staple, tack or pin items you wish to showcase. They come in different lengths and heights in order to fit the room of any size. Their stability is also widely praised – made from steel and designed with self-leveling casters, they represent a durable art display solution. Check out the photographs from other galleries that have already had the chance to enjoy the versatility of the Screenflex portable partitions. How can Screenflex room dividers help art market? Screenflex’ room dividers fibreglass covering, effectively absorbs sound and creates a peaceful environment. 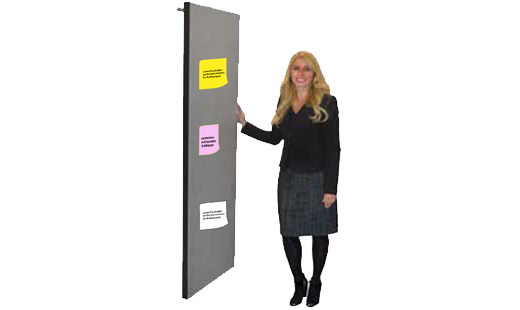 A Screenflex room divider can serve as a noise-reductive solution, markerboard, or a pinboard, thus adapting to your specific requirements. Due to the quality of materials and parts used to assemble our room dividers, you can count on them to serve you for years to come. To provide an instant solution, we deliver our room dividers 100% assembled and ready to be used in a matter of moments, so you can focus on other tasks at hand. Choose any of the 30 fabric colors that come in 3 different designs and 8 vinyl colors selections, so that it fits the design of your facility. Our room dividers are quick and simple to assemble and reassemble, so you can roll them in and out of the room, depending on your immediate needs.